134516230 –For courses in Nutrition for non¿-majors. Nutrition: An Applied Approach introduces non¿-majors to nutrition with an innovative format that promotes long-term learning without rote memorization. Key focus areas include: functions of vitamins and minerals in the body, fluid and electrolyte balance, antioxidant function, bone health, energy metabolism, and blood health. The 5th Edition shows how nutrition concepts apply to our daily lives with new chapters on food equity, sustainability, and obesity. A new suite of ABC News Videos and Focus Figures explore nutrition, human disease, and nutrients found in food. To engage students and help them learn, understand, and retain even the most difficult concepts, each chapter now includes Learning Outcomes and a new study plan that connects to Mastering™ Nutrition reading quizzes and exercises. Mastering™ Nutrition is an online homework, tutorial, and assessment program designed to work with this text to engage students and improve results. Interactive, self-paced tutorials provide individualized coaching to help students stay on track. With a wide range of activities available, students can actively learn, understand, and retain even the most difficult concepts. Note: You are purchasing a standalone product; MasteringNutritiondoes not come packaged with this content. Students, if interested in purchasing this title with MasteringNutrition, ask your instructor for the correct package ISBN and Course ID. Instructors, contact your Pearson representative for more information. 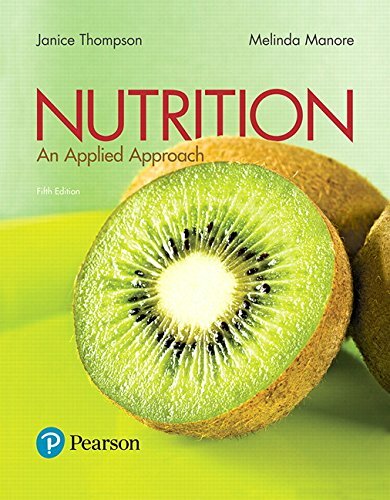 Nutrition: An Applied Approach , 5th Editionis also available viaPearson eText, a simple-to-use, mobile, personalized reading experience that lets instructors connect with and motivate students – right in their eTextbook.Learn more.